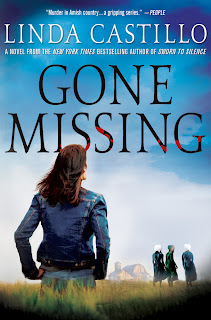 Gone Missing is the newest book in Linda Castillo's suspense series set in Ohio's Amish Country and starring small town Chief of Police Kate Burkholder. The New York Times bestselling series has garnered notable reviews, being called "impossible to put down" (BookPage), "gripping" (People) and "teeth-chattering suspense (USA Today). Less than twenty pages into Gone Missing (my first Castillo book), I was already echoing those descriptions and adding a few more of my own. Kate Burkholder understands the confusion and secret longing for city life that go hand in hand with many Amish teens. She has, after all, once walked in their shoes. Raised in a devout Amish family, Kate rebelled against the strictures of that life and left when she turned eighteen. Now thirty-three, she has a successful career and sometime relationship with state agent, John Tomasetti but coming to terms with her place in the world, her excommunication from the Amish community and the strained relationship with her family is an ongoing journey. If we're talking baggage, John Tomasetti has a whole set that he carries in his heart. A widower whose wife and two children were murdered, he's just beginning to emerge from grief and learning to reach for happiness once again. He and Kate have worked together, become friends and are occasional lovers but he's ready to deepen the relationship...if he can scale the emotional walls she's erected around her heart. Oh yes, and keep her alive long enough to tell her how he feels. When an Amish girl disappears in another part of the state, Tomasetti knows Kate is the person they need on their team if they have any hope of solving the case. The Amish are a closed society; not trusting outsiders. They won't be forthcoming with any information that may cast the slightest negative light on them or their religion, even if that information could help find the missing teen. Kate knows the Amish ways, speaks Pennsylvania Dutch and though she may be viewed with suspicion and mistrust by her own Amish family and former friends, her past gives her the necessary tools to gain the trust of the people in the community where the missing girl lived. They've barely begun the investigation when another girl goes missing, a body is found and it becomes apparent that these girls are not leaving their homes voluntarily. The danger escalates and when it touches Kate's own family, she finds herself in a race against time to catch a killer before more lives are lost - including her own. I love a good romantic suspense story that keeps me on the edge of my seat and this book certainly fits that bill. I began reading Gone Missing in the waiting room at my doctor's office yesterday, continued reading through dinner and finished it last night. It's a fast-paced story with numerous twists and turns that grabbed me with it's compelling first scene and still haunts me a day later. I have the feeling that haunting won't go away for awhile. The emotions are intense, the suspense thrilling and the mystery well written and realistic. The characters - good guys and bad - are so vividly and realistically depicted that I was drawn into their lives and their minds with ease. And let me tell you, some of those minds are scary places to be. I was also fascinated by the Amish communities in which most of the story takes place. I already knew a bit about their culture but learned much more through the actions of characters in this book. It's clear that this aspect of the story was well researched. I probably would have given this book five stars had it not been written in first person. I found it a bit disconcerting for the first half of the book. Having said that, though, by the time I got to the middle of the book when the tension is boiling over, the action practically non-stop and I was wholly invested in the characters, the first person language ceased to be a problem for me. While this book stands on its own, Kate's individual growth journey begins with the first book in the series and continues with each successive book while her relationship with John begins at some point during the first three books. I'll be buying those books soon. I'm so intrigued by this character; by her dedication to helping others through her police work and her emotional struggle with the two worlds she attempts to straddle; liked and well respected in her new life, cast aside by her old. I'm looking forward to going back to the beginning and taking this journey with her while waiting for the next book in the series (which the author's website says she's hard at work on). I also recently learned that the first book in the Kate Burkholder series, Sworn to Silence is slated to be made into an original movie starring Neve Campbell in the lead role. I rarely agree with Hollywood casting of books I love but, with this one, I have to say I think they're spot on and I can't wait to see the movie when it comes out! Are you a fan of romantic suspense? Have you read any Amish romances? Visited Amish Country? Are you reading the Kate Burkholder series? 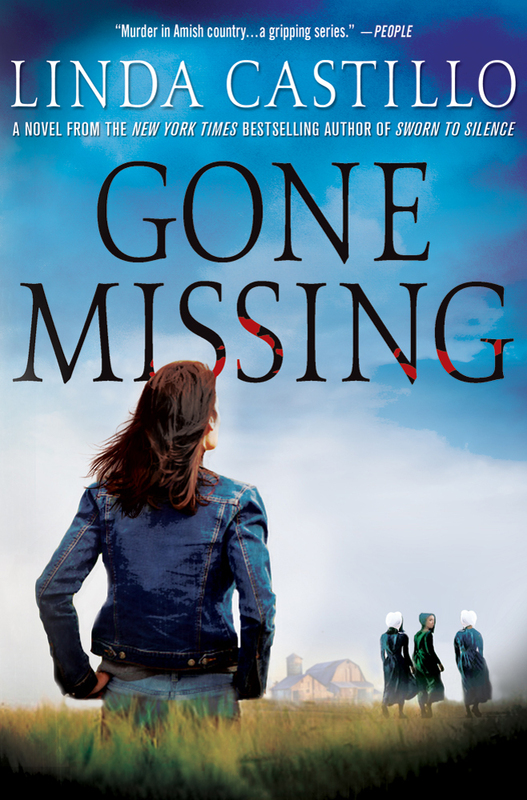 We're giving away two copies of Gone Missing today provided by St. Martin's Press. (U.S. addresses only) Leave a comment to be in the running and be sure to tell us if you're in the U.S.
Review copy received from Big Honcho Media. Romantic suspense is my favorite! I love thie Kate Burkholder series. I had never read anything with an Amish background, and it just makes the book so much more exciting. I would live to win a copy of this book to add toy collection. Trish, I hadn't read an Amish story either. I agree with you that it makes the story that much more interesting. I'm so looking forward to reading the rest of the books! Oops, I do live in the USA. I like romantic suspense books. I haven't had the opportunity to read any of the Kate Burkholder series but have read a couple of Amish books. I just checked out her website, and the series looks quite interesting - I don't know how I've missed it! Be sure to let us know in your comment if you have a U.S. address so we can put you in the drawing for a copy of the book! The Amish culture is fascinating and a suspense novel is a great way to increase awareness. I live in New York. I agree! I grew up in the Midwest so I had some familiarity with the Amish culture but not with the degree of intimacy that's shown in this book. Romantic suspense is always compelling and special. I haven't yet read this series which sounds fantastic. I live in the U.S.
Traveler, I can't speak for the entire series (yet) but Gone Missing is definitely compelling! This author really knows how to ratchet up the suspense. I have read an Amish book which was wonderful. Romantic suspense is a big favorite of mine. Thanks for this great post. I live in the US. Petite, which book did you read? You know I don'r read a lot of romantic suspense, PJ, but this sounds interesting. It sounds like something my sister might like too. I'll suggest it to her. Romantic suspense is the only romance subgenre she reads. I've enjoyed the first two books in Shelley Shepard Gray's Inspy romantic suspense trilogy, The Secrets of Crittenden County. It features Amish characters with an English mix, and I'm looking forward to the concluding book and the solving of the mystery in September. I'll have to check out Gray's books. Castillo uses a mix of Amish and English too. I find that it magnifies the differences between two and intensifies the suspense. Linda's books do sound great. I haven't read any Amish books. I do read a lot of romantic suspense, though. Thanks for the post and giveaway. I am in the US. As I said in my review, this was my first Amish book. I can't speak for other authors writing against this backdrop but Castillo does a fabulous job. I have met a few Amish people. I think we are fascinated by their life style because it is so different and so peaceful. I think that's what makes this book so compelling, Michele. You just don't expect things like this to happen within the peaceful Amish community. I live only a few miles from Amish country, and have never become better acquainted with their culture, beliefs, or society. The review created a need in me to read this book, if not the series. I live in the US, Northeast IN. Chrissy, I don't think you're unusual. The book highlights the separation between the Amish and English communities and the fact that most people outside the Amish really know very little about their beliefs and lifestyle. I enjoy romantic suspense - the not knowing. I've not read any of this series though. Jodi Picoult is probably the author I first read about the Amish. We are about 4 hrs. away in Pa from a large community. In fact we have Mennonites in our family tree that have similar beliefs. Hi Catslady! I've lived in places with large Mennonite populations and have friends who are Mennonite. I was intrigued by how the relationship between Amish and Mennonite was portrayed in this book. Haven't read any Amish books but would like to learn more about their culture as I have been to their part of PA. Haven't read this series, but do know Linda Castillo knows how to write suspense. Enticing excerpt. Donna, your're right. Linda Castillo definitely knows how to write suspense! This book is a 277 page hardback and I read it in one day. It would not let me go! I am not usually a fan of supsense stories, but there are some that have been written well and this story sounds like it is one of those such stories. I have read Amish-set stories, but Christian romance books, mainly written by Beverly Lewis. I have been to "Amish Country" here in Iowa. We have 2 main settlements in Kalona and Hazelton. I enjoy going to their general stores because you seem to find items that you don't find elsewhere, including good work boots. I was also fortunate to visit an Amish elementary, but only due to some friends being good friends with the Amish and they gave me permission to visit. Deb, I think you might enjoy this book. While there's plenty of action and intense suspense, it's very much a character driven story and very well written. Have to laugh at the Amish store owner. Guess they're not old fashioned in everything! lol! I do enjoy romantic suspense. It is one of my favorite genres. I think it is the fast pace of the stories that appeal to me. I haven't read any Kate Burkholder stories but I will check them out. Hope you enjoy them, Maureen! I enjoy romantic suspense. I have never read any Amish stories, but I have been in Amish country before. I haven't read any of Linda's books before. Sounds good. It's a fascinating culture, isn't it? I have just started getting into romantic suspense. I have not read any amish romances before. I live in iowa, not far from kalona, which is a large amish colony. Would love to win and read thies book. You're just getting into romantic suspense? Oh wow, you have so much great reading ahead of you! Sounds great. Even though the amish have their ways, they are still fascinating. I love suspense and would love to win this book. I agree, Zippy. (love your name!) It's a fascinating culture. My Grandmother was a huge Amish romance reader. She enjoyed them so much and usually passed them on to me, so I got to enjoy them as well. Any favorite authors of Amish stories? I love good suspense. Good romantic suspense lets me get the suspense and still have a happy HEA. We are lucky to have so many good writers in this genre. I have read Amish stories by several authors. Mixing their simple life with the challenges our modern society presents gives the stories an added dimension. Kate's situation gives this series an added depth. I don't think I have read any of Linda Castillo's books, but that will be remedied soon. Long running series that develop characters like this are well worth our time. I will make sure I read the series in order. It will be more enjoyable for me. Thanks for the review and making us aware of this series. I am in the US. I hope you enjoy the series, librarypat. I loved the added depth of Kate's history with the Amish society. The combination of romantic suspense and Amish community is a very intetesting one. So, I think I could really enjoy this novel: the plot sounds strong with two likable characters. I personally find the Amish culture to be fascinating in some ways and I am glad to be exposed to their uses and traditions here in Pennsylvania. It's a very strong plot, Mina. I'm already anticipating a return visit to Kate's world! I do enjoy a good romantic suspense series, and this one sounds like one I could really get into. I have been a fan of Faye Kellerman's "Decker/Lazarus" series for quite some time. Her series is set in Southern California not too far from where I live so I can attest to the realism of the settings. The main protagonists are Modern Orthodox Jewish., which is another factor that I can relate to. Peter Decker is a homicide detective and solves his cases often with some kind of help or insight from his wife, Rina Lazarus. If you substitute one religion/lifestyle for another; there seem to be some similarities between the Kellerman series and Castillo's I am also a fan of Christina Dodd's romantic suspense. Her most recent R/S series (Bella Terra)consists of three books that I could not put down and had me up all night finishing the three books. Thanks for another great review, PJ, and for introducing me (Yet again) to another new autor's work! I like suspense books. I've visited Amish Country. My Daughter loves rom suspense. I enjoy an occasional read also. Been To Amish Country several times. Havent read Kate's series. Am living in the US.